Suntour Edge (model SL-4050) shifters. 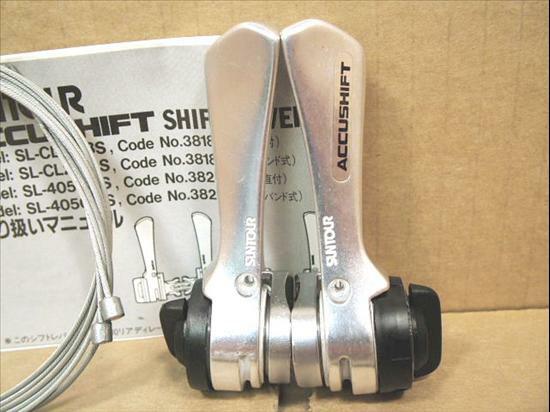 This is a late 80's Accushift shifter set that has a right-side setting for 6-speed index or friction shifting. They are not high-end Suntour shifters, but still a good quality offering that was probably intended for Suntour sport/fitness drivetrains. The bright silver finish is nice and still shows as new (and please note the "Accushift" labeling on the right side shifter is just a decal...so if someone wanted to remove the labeling for a cleaner look, then this would be possible). One other note on the shifters...they will bolt onto down tube braze-on bosses without a problem and please note the adapters/spacers included with these shifters are sort of a hybrid design. They have a partial half-moon shape to them, so they will mount to a vintage steel down tube, which typically measure 28.6 mm in diameter. However, because these adapters/spacers also have a fairly significant flat profile that flanks each side of the curved (half-moon) profile, they will also mount onto an oversized (aluminum or equivalent) down tube, which typically has down tube shifter bosses with half-moon spacers/adapters already attached (as part of the bosses). The end result is these larger diameter composite frames will have down tube shifter bosses with a flattened profile at their mounting point (with the shifters). As a result, these hybrid-type shifter adapters/spacers are really capable of mounting on just about any type of down tube shifter boss, which is a very nice feature given that shifter adapaters/spacers can somtimes be a difficult find.